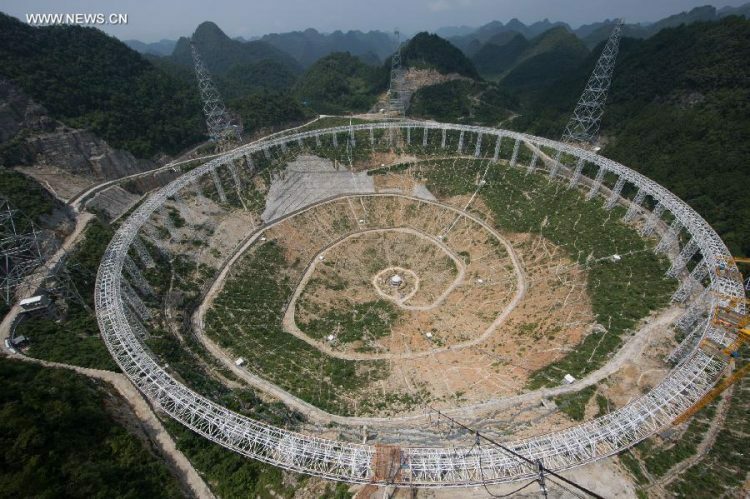 The $180m radio telescope, the size of 30 football fields, is expected to be operational by September, state media says. 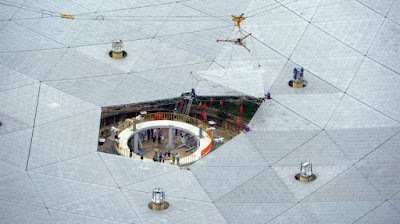 The “Five-hundred-metre Aperture Spherical Telescope”, or FAST, is the size of 30 football fields and has been hewn out of a mountain in the southwestern province of Guizhou. 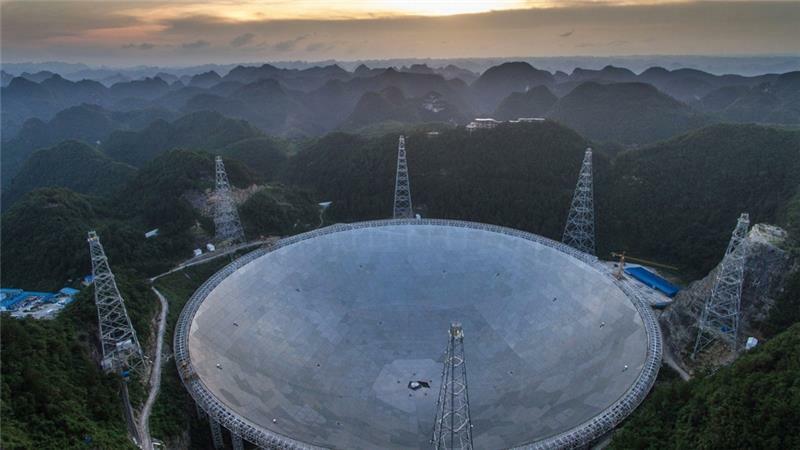 “The project has the potential to search for more strange objects to better understand the origin of the universe and boost the global hunt for extraterrestrial life,” says Zheng Xiaonian. He is the deputy head of the National Astronomical Observation under the Chinese Academy of Sciences, which built the telescope, said on Sunday. The world’s largest telescope would be a global leader for the next one to two decades, Xiaonian was quoted as saying by the official Xinhua news agency. A number of trials will follow the hoisting of the final piece on Sunday. The telescope, which took about five years to build, is expected to begin operations in September. China’s space programme has been a priority, with President Xi Jinping calling for the country to establish itself as a space power. Beijing’s ambitions include putting a man on the Moon by 2036 and building a space station – work on which has already begun. China insists its programme is for peaceful purposes, but the US defense department has highlighted Beijing’s increasing space capabilities, saying it is pursuing activities aimed to prevent adversaries from using space-based assets in a crisis. The telescope was first proposed in 1994. The project was approved by the National Development and Reform Commission (NDRC) in July 2007. On December 26, 2008, a foundation laying ceremony was held on the construction site. Construction started in March 2011, and the very last piece of the triangular panel was installed on the morning of 3rd of July 2016. The installation for the world’s largest telescope began on or about 10:47am and the installation operation lasted about one hour. “FAST” in Qiannan of southwest China’s Guizhou Province. FAST will have 4600 triangular panels and be similar in design to the Arecibo Observatory, utilizing a natural hollow (karst) to provide support for the telescope dish. As the name suggests, it will have a diameter of 500 metres (1,600 ft). Unlike Arecibo, which has a fixed spherical curvature (and thus a complex feed system to counter spherical aberration), FAST will use an active surface that continually adjusts to create a parabola aligned with the desired sky direction. FAST will have an effective dish size of 300 m (comparable to Arecibo’s effective diameter of 300 m for observations at zenith). FAST will be capable of covering the sky within 40° from the zenith (compared to Arecibo’s 20° range). Its working frequency range will be 70 MHz to 3.0 GHz, with a pointing precision of 4 arcseconds. The 19-beam receiver is built by the CSIRO as part of the ACAMAR collaboration between the Australian Academy of Science and the Chinese Academy of Sciences. The site’s karst depression is large enough to host the 500-meter telescope and deep enough to allow a zenith angle of 40°. The light-weight feed cabin —suspended 140 m above the reflector— will be driven by cables and servomechanisms in addition to a parallel robot as a secondary adjustable system to move with high precision. The chief scientist of the project for world’s largest telescope is Nan Rendong, a researcher with the Chinese National Astronomical Observatory, part of the Chinese Academy of Sciences.